I sell it as a raw painting, unmounted, unframed. The painting is signed at the front by me. This really is an enchanting picture which is striking in every way. Love everything about it. I feel lost in a day dream with him . . . Thank you for making your beautiful artwork available. Beautiful watercolor painting. He feels alive. Thank you for all of the generous extras -- very greatly appreciated. Simple, easy, smooth transaction. Gifted artist, conscientious seller. 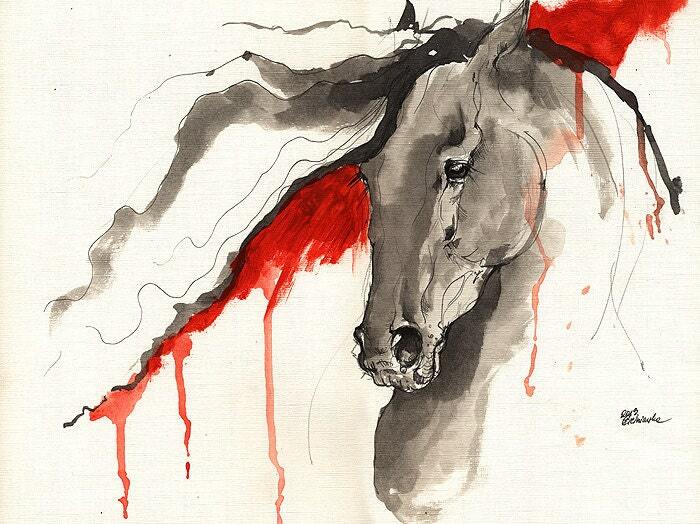 A warm feeling of equine affection has been captured and conveyed in this watercolor painting. The horses radiate quite calm. I have really enjoyed building a collection of Angel's equine artwork -- the only tough part is having to pick and choose between her many beautiful offerings. A very talented artist with an eye for detail and coloring. I am very glad I have had the opportunity to buy several of Angel's paintings here. The experience has been very pleasurable. Each painting has been consistently high quality and shipped in a timely, safe manner.